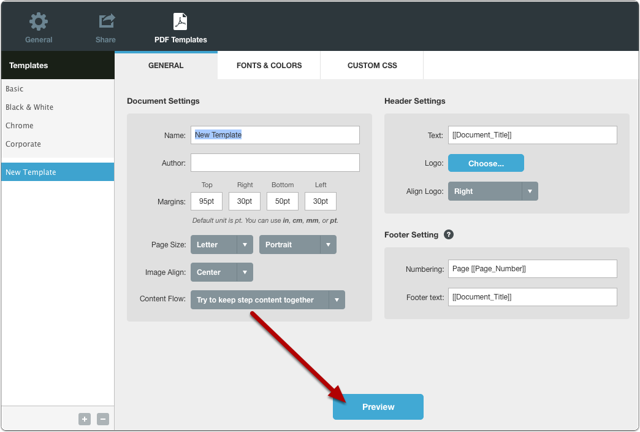 This article describes how to create a custom PDF template that allows for some common customizations. If you have very specific needs then please have someone with HTML and CSS knowledge refer to our manual on making custom PDF modifications by hand. 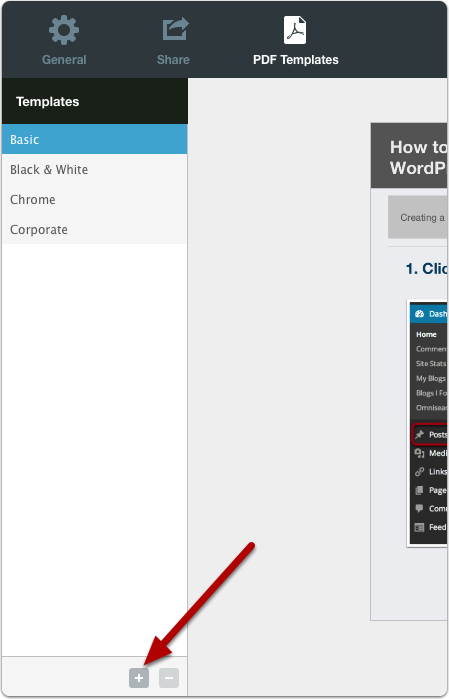 Click on the + button to create a new custom template. From the General tab you can customize things such as the page size, orientation, image alignment, content flow, header, and footer. For a list of variables that you can use in the Header and Footer text refer to this article. Whenever you want to see how your template will look, click the Preview button. You can specify the font, color and size of text in the PDF document from the Fonts & Colors tab. If a font isn't set for a particular object, the Default Font will be used. 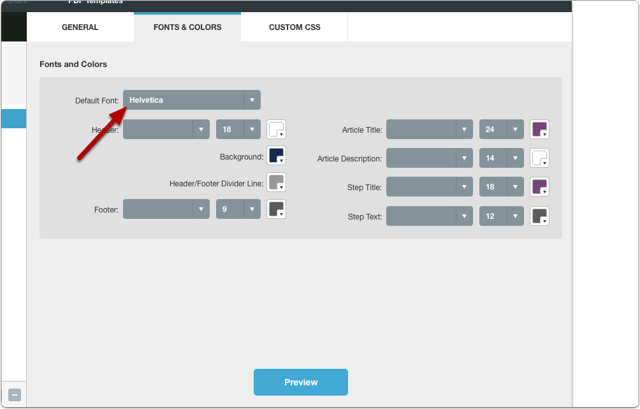 The Customize CSS tab enables you to make adjustments to elements that aren't available in the user interface. Refer to the article on custom CSS recipes for some examples. Is it possible to "export" a PDF template that I have created and have the other 12 users "import" that template. I see a folder C:\Program Files (x86)\Clarify 2 Beta\components\templates\user. 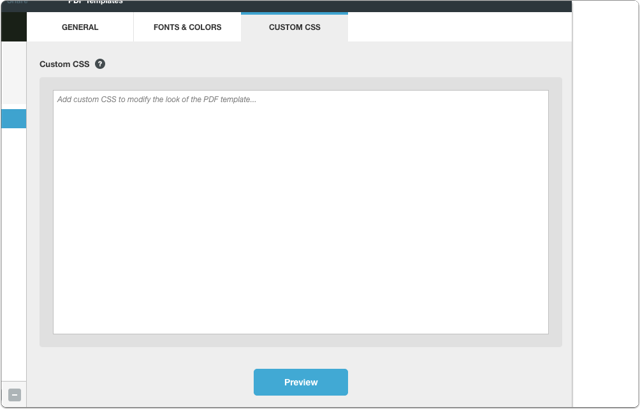 Is it possible that the new PDF template I have created is stored there? Right-click on the template and there is an option to export, import, or reveal the template folder. Just export the template and then have the other users import the file you exported. Is it possible to convert the standard templates page size from letter to A4? @Trevor - Yes, just select a different page size from the "Page Size" menu in the General tab. Thanks Trevor, I can specify a different page size in new templates I create but not in existing documents I have created using the standard templates. Is there any way to change the background colour behind the step-titles? Is this something you might add in future? You are interested in the .step-title class. For example, the following CSS would put a light grey background behind step titles and add 20 pixels of padding round the step title text. I'm missing the possibility of adding a directory as first page. Would be great if the entries could be links to the anchors. There is a link to download the template with the table of contents. Maybe that will help you out. Is there a way to change to a custom template after you've already started a document? @Joseph - Custom templates are completely independent of Clarify documents. You can change them at any time and the changes will be used the next time you export the document to PDF. Accented characters should work. Send an email to support@screensteps.com with a sample PDF, the version of Clarify you are using, and the operating system you are running Clarify on and we can take a look.